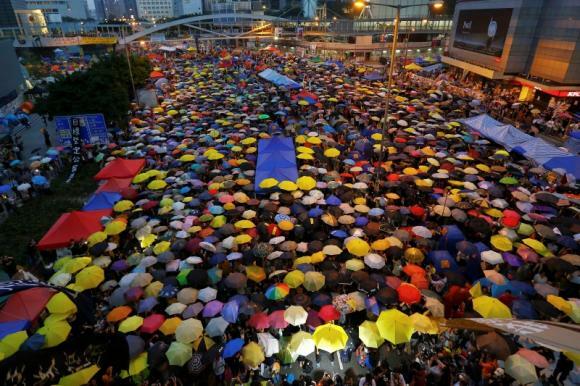 Protesters open their umbrellas, symbols of pro-democracy movement, as they mark exactly one month since they took the streets in Hong Kong’s financial central district October 28, 2014. The above is a popular Chinese saying often used as a metaphor to describe the persistent fear after a traumatic event. It is understandable that the Chinese Communist Party (CCP) felt threatened by mass protest of Falun Gong, an organization that popularizes a kind of qigong, a breathing technique to improve health and treat some diseases, and had to ban it. There were so many people practicing Falun Gong. They could be regarded as a political organization able to confront the Party. It is still understandable that Liu Xiaobo, 2010 Nobel Peace Prize laureate, was jailed eleven years for his role in advocating Charter 08 that calls for greater freedom of expression, human rights and multi-party democracy though his campaign got nowhere in China. Within six months, only 8,600 of China’s over one billion people had put their signatures on the document. Since Liu had participated in the Tiananmen Protests and been jailed for that, it was only natural for CCP to punish him again when he continued such activities no matter whether he had violated the law or not. However, it puzzled everyone that Zhao Lianhai, founder of Home for Kidney Stone Babies, a concern group for victims of melamine-poisoned milk, was brought to court in handcuffs and shackles for fighting for victimized babies’ rights. The handcuffs were not removed until his lawyers protested, but his feet remained in shackles for hours throughout the hearing. What felony did he commit so as to be humiliated like that? According to his prosecutor, Zhao Lianhai “maliciously made the tainted milk incident an issue on the Internet, instigated and gathered people to shout slogans and hold illegal assemblies and thus seriously disrupted public order.” In fact, Zhao’s website helped families with babies poisoned by tainted milk share their experiences, maintained a database of medical records and provided practical help such as medical information about children sick due to tainted milk. Since the government itself made public the evils done by the enterprises that sold the tainted milk and the trials and verdicts of the cases of the managers of those enterprises, what was Zhao’s website wrong in doing so? As reported by Hong Kong and Western media, the prosecutor knew well himself that the protests lead by Zhao Lianhai were entirely peaceful and gave rise to no serious disturbance. The protesters merely shouted some slogans and held some assemblies without permission. Article 290 of China’s Criminal Law provides, “Where people are gathered to disturb public order to such a serious extent that work in general, production, business operation, teaching or scientific research cannot go on and heavy losses are caused, the ringleaders shall be sentenced to fixed-term imprisonment of not less than three years but not more than seven years;” Since no work in general, production, business operation, teaching or scientific research was affected nor any losses caused, the disturbance was by no means serious. There is, therefore, no ground to prosecute Zhao! As for holding some harmless assemblies without permission, Zhao Lianhai contacted government officials times and again but was pressured instead supported by them. Since government officials tried hard to cover up the evils done, how could Zhao get permission for the assemblies? Zhao and others were justified in holding peaceful assemblies without permission. They had such rights according to China’s constitution. Having seen all the good things CCP has done for the people in providing medical insurance, pension, housing, etc. for workers and peasants and giving relief to earthquake-, mudslide- and draught-stricken areas, people cannot help but wonder why the government has no sympathy for parents of melamine-poisoned babies. The only baby a couple is allowed to have has been poisoned and no one knows how the poison will affect the baby’s health in the future. Thanks to Zhao Lianhai’s leadership, those parents restrained their anger and protested peacefully. Shall the government not make allowance for that? Moreover, Zhao Lianhai’s own only baby had kidney stones due to the tainted milk. How can he be accused of maliciously exploiting the incident to make trouble? As a victim’s father, Zhao himself has the right to express his anger peacefully on the Internet and in the streets. Is CCP top leader Hu Jintao’s “putting the people first” in his Scientific Outlook on Development empty talks? No, judging by what Hu Jintao and Premier Wen Jiabao had done, they did have put the people first in lots of things they had done. Why Zhao Lianhai was treated so callously then? The attack that CCP suffered from Tiananmen Protests was like the bite of a snake, which threatened Party’s very survival. The protests led by Zhao Lianhai though quite harmless like a rope compared with the “snake” the Tiananmen Protests, CCP was scared just as described by the Chinese saying that served as the first subhead: “Once bitten by a snake, one is scared all one’s life at the mere sight of a rope.” That was why CCP made such a show to humiliate and punish Zhao Lianhai. I would like to call this CCP’s Tiananmen Syndrome. It makes CCP suppress any mass protest whatever in order to prevent such protest from growing into one like the Tiananmen Protests that may threaten CCP’s monopoly of state power. Knowing the above, one will not be surprised that Reuters gives its report today the title “Hong Kong protests a ‘national security issue’ for China”. The writer of the report is correct in mentioning the separatist trend in the Umbrella Movement. It is natural that those who fight for democracy may believe that they may achieve true democracy if Hong Kong is an independent state. However, that will give democracy fighters a dangerous label as separatism is a heinous crime in Chinese law while democracy is citizen’s right advocated in Chinese constitution though such provision on democracy has not been implemented. When Chinese troops fired at democracy fighters during Tiananmen Massacre, they killed democracy fighters for their “counterrevolutionary crime” instead of their fight for democracy! Hong Kong democracy fighters, be careful to avoid that dangerous label! Hong Kong’s pro-democracy protests have escalated into a national security issue threatening Chinese sovereignty over the Asian financial center, a delegate to China’s rubber-stamp parliament said on Thursday. Businessman and lawmaker Michael Tien Puk-sun said support for Hong Kong Chief Executive Leung Chun-ying was crucial to the city’s future stability and there was no longer any room to remain neutral. The protesters have blocked key intersections for a month in their demand for fully-democratic elections for the city’s next chief executive in 2017. Beijing has said it will only allow a vote among pre-screened candidates. While the protests have remained largely peaceful, flashes of violence and dramatic images of students dressed in raincoats and safety goggles using umbrellas to protect themselves from tear gas and pepper spray have reared a new political consciousness in the city of seven million. “Because China has declared there are foreign forces and political influence behind Occupy Central, it has been elevated to a national security issue,” Tien said, referring to one of the protest groups. Tien was speaking a day after his brother, James Tien Pei-chun, was expelled from China’s top parliamentary advisory body and resigned as leader of Hong Kong’s pro-Beijing Liberal Party after urging the Leung to step down. Beijing has said it fully supports Leung. James Tien’s swift removal from the Chinese People’s Political Consultative Conference (CPPCC) is a sign of how concerned Beijing is about the protests which, at their peak, drew more than 100,000 people into the streets. Hong Kong’s increasingly charged political climate is also putting Chinese government officials on tenterhooks. China’s liaison office in Hong Kong called an urgent meeting with Liberal Party leaders on Tuesday, calling them in the morning and asking them to attend a dinner meeting that night, said Liberal Party lawmaker Felix Chung. China’s most senior official in Hong Kong, Zhang Xiaoming, explained the CPPCC’s decision was specific to James Tien, Chung said. Zhang also said Beijing would continue to support the Liberal Party, according to Chung. The party in Hong Kong is pro-establishment and comprised largely of businessmen. Michael Tien said that the CPPCC was forced to act given the backdrop of the protests. CPPCC members are expected to fully support and promote its resolutions – or at least keep quiet once they are made, he said, adding that if the CPPCC had failed to respond to his brother’s comments, its bylaws and code of conduct risked becoming “a bunch of hot air”. While CPPCC officials have said they still consider James Tien loyal, his brother says there is still debate over how to categorize him. “One camp calls him the ‘conscience of Hong Kong’ because he is willing to sacrifice his own political career to speak his mind. The other camp says he is not loyal and has betrayed his status as a pro-establishment member,” Michael Tien said. James Tien declined to comment. US intelligence community has been notorious for its incompetence. It had got from Chinese intelligence information on Japan’s plan of stealth attack at Pearl Harbor but failed to make the US prepared for the attack. It failed to follow up information about terrorists to prevent 911, a blunder that cost thousands American lives. The most serious failure of US military intelligence was its failure to detect Chinese strategic nuclear submarines. The Chinese navy is “not there yet” in terms of undersea power despite deploying a current force of 55 submarines, both diesel and nuclear powered, Greenert said. Later Washington Times carried Bill Gertz’s post on July 23, 2013 titled “China deploys new class of strategic missile submarine next year” at The Washington Free Beacon, saying that US defense officials expect that China would “begin the first sea patrols next year of a new class missile submarine”. It proved China’s success in keeping secret its strategic nuclear submarine capabilities. However, at that time China was provoking Japan to fight a war with China. The US might be involved in the war but China was not afraid. It had DF-21D anti-ship ballistic missiles, and lots of anti-ship cruise missiles and three flotillas of Type 022 fast missile boats to conduct saturate attack to sink US aircraft carriers in the war. The problem was that US ignorance of China’s submarine second-strike capabilities made it possible for the US to retaliate with nuclear weapons. To show such capabilities, first, the next day, i.e. on July 24, 2013, Hong Kong’s pro-Beijing The Mirror monthly revealed to Taiwan’s Central News Agency in haste an article it was going to publish in its next issue, giving some shocking information about China’s strategic nuclear submarines. The Mirror’s report by Liang Tianren revealed that China’s third-generation strategic nuclear submarines had been in service but not detected by the US. Later, China’s official TV station CCTV published footages of Chinese nuclear submarines and described their activities. 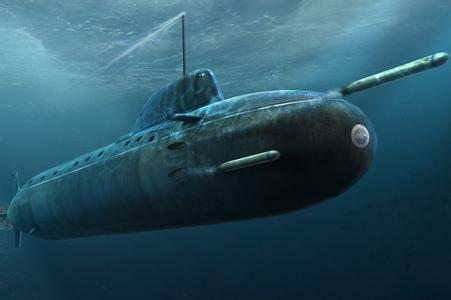 The Mirror and CCTV’s reports did not seem convincing enough as US military just could not believe that China had been able to develop advanced nuclear submarines. To be more convincing China showed its submarines passing the Malacca Strait and then disappeared under the sea and reappeared in Indian Ocean. Chinese submarines’ such activities are described in details in Wall Street Journal’s article on October 24, which I am going to give full text later. Now, according to the article, the US is nervous in the face of Chinese submarine second-strike capabilities. China also knows that. Huanqiu.com said in its report yesterday that in an interview with CCTV, Zhao Xiaozuo, deputy director of Sino-US defense relations research center, says that China’s development of submarine capabilities has made the US nervous. The US believes that it constitutes extremely grave challenge to its nuclear superiority. In fact, the US had to be nervous long ago as Chinese nuclear submarines were able to cruise in the Oceans long ago. US failure to detect them did not mean that they did not exist. It seems that the US is ignorant that China is conducting an arms race with it in earnest. China is surpassing and will surpass the US in military capabilities in quite a few areas of weapons and military technology. For details please refer to my book Space Era Strategy: The Way China Beats The U.S. In addition to the construction of seven artificial islands on the reefs in the South China Sea, according to a report at the website of Jane’s Defence Weekly on October 27, China is building floating docks for its exploitation of the sea areas. Jane’s has interviewed officials at China Ship Science Research Center and leant from them that they are now developing various floating docks. In the 2014 International Shipbuilding Marine Equipment and Offshore Engineering Exhibition for China, they displayed the design drawings of their floating docks. 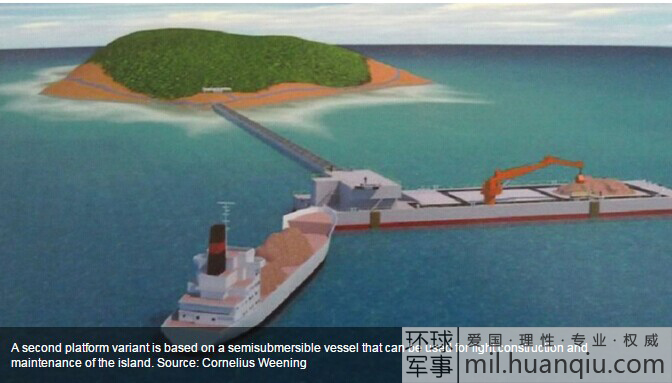 The floating docks will be built on the Chinese mainland and shipped to the destination island to assemble. There will be a bridge with loading capacity for 10-ton truck to link the dock with the island. A multi-functional dock provides berth for 1000-ton ship, maintenance of fishing boats, electricity, fresh water storage and supply, collection, storage and supply of rainwater, etc. There will be a variant to serve half-submerged oil rig. The floating docks have engines to move on their own but not for a long distance. They can be used for light construction and maintenance of an island. They can also provide temporary residence for construction workers. As they rely on fuel from outside for their operations, the center is developing small wind-mill generator for them. They certainly can also use the electricity generated by the large wind-mill generators on the island. This blogger’s note: Such large-scale construction and development are certainly no merely for military purpose. China is to exploiting the energy, fishery, fish farming alga farming and tourism resources on a large scale in the South China Sea. 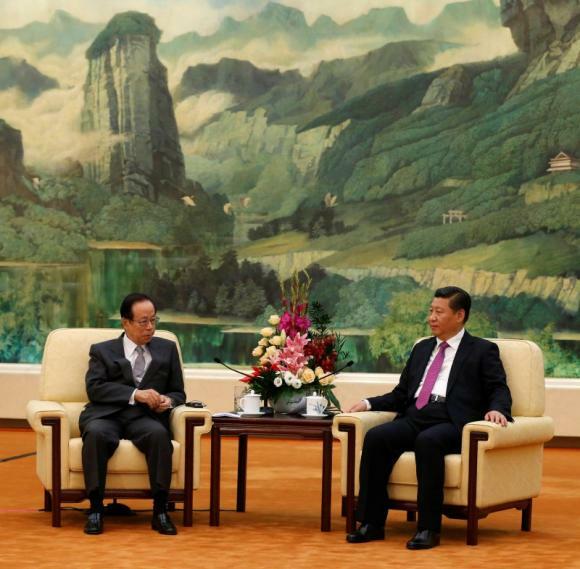 Former Japanese Prime Minister Yasuo Fukuda (L), chairman of the Boao Forum, meets Chinese President Xi Jinping at the Great Hall of the People in Beijing October 29, 2014. I have written some posts on the prospects for improvement in Chinese-Japanese relations through a quite possible summit meeting between Chinese President Xi Jinping and Japanese Prime Minister Shinzo Abe on the sideline of the APEC summit in Beijing next month. Whether there will be the summit depends on how well Abe accepts China’s two conditions: Admitting there is dispute over the Diaoyu Islands (known as Senkaku in Japan) and Promising not to visit Yasukuni Shrine again. (Reuters) – China said on Wednesday it will extend all possible courtesy to Japan at next month’s Asia-Pacific Economic Cooperation (APEC) meeting in Beijing, but gave no indication it would agree to a leaders’ get-together. Expectations have been growing in Japan for Prime Minister Shinzo Abe to meet Chinese President Xi Jinping for an ice-breaking chat next month on the sidelines of the gathering of Asia-Pacific leaders. A one-on-one meeting would be a symbolic breakthrough in ties between the world’s second- and third-biggest economies, which have turned frigid in the past two years over a territorial row, regional rivalry and the bitter legacy of Japan’s wartime occupation of China. Asked about the possibility of a Abe-Xi meeting in Beijing, Chinese Foreign Minister Wang Yi said that it was China’s duty to treat its guests well. “China is the host, and there is a custom in China, which is that visitors are all guests. We will do all the necessary honors for our guests,” Wang told a conference. “As for the problems and obstacles which are affecting the normal development of Sino-Japanese relations, this is objectively a reality that cannot be avoided,” added Wang, a former Chinese ambassador to Japan. “We hope that the Japanese leader and Japan can face up to the existence of the problem and show sincerity to resolve it,” he said, without elaborating. Former Japanese Prime Minister Yasuo Fukuda on Wednesday met Xi at Beijing’s Great Hall of the People as part of a delegation from the Boao Forum, which China likes to tout as its answer to Davos. Xi and Fukuda shook hands, Japan’s Kyodo news agency reported, without saying what they said to each other. Fukuda went to China late in July on a “stealth mission” to broker a rapprochement and convey Abe’s call for dialogue, Japanese media have reported. During the visit, Xi voiced concern over two-way ties but showed his desire to mend them, the Nikkei business daily said, citing sources on both sides. Xi Jinping’s anti-corruption has been quite successful at home. He has succeeded in prosecuting former Central Military Commission Vice Chairman Xu Caihou. However, lots of corrupt officials have fled abroad with their ill-gotten assets. He is now seeking international help at the APEC summit to catch those officials and recover the assets worth more than $1 trillion according to estimate. (Reuters) – Next month Asia-Pacific Economic Cooperation (APEC) summit in Beijing will agree to a deal to fight corruption, China’s foreign minister said on Wednesday, appealing for more international cooperation. Chinese President Xi Jinping has launched a sweeping campaign against deep-seated graft since assuming power two years ago, but has been hampered to an extent by difficulty in getting corrupt officials and assets back from overseas. China announced in July an operation called Fox Hunt to go after dirty officials who have fled overseas with their ill-gotten gains, with Australia, a popular destination for such criminals, having already promised cooperation. Chinese Foreign Minister Wang Yi told a conference in Beijing that the anti-corruption plan was one of the agreements set to be signed at APEC, though he did not give details of its contents. “Anti-corruption is one of the topics up for discussion, which all parties care about. The world has already seen China’s determination and measures taken to fight corruption,” Wang said. “We hope to get cooperation and support from the international community, especially in getting back those who have fled and ill-gotten gains from relevant countries, so your country does not become a haven for hiding criminals,” he added. The United States, Canada and Australia are the three most popular destinations for suspected Chinese economic criminals, Chinese state media have said. The sums of money believed to have been spirited out of China from all types of malfeasance are staggering. The Washington-based Global Financial Integrity group, which analyses illicit financial flows, estimates that $1.08 trillion illegally flowed out of China from 2002 to 2011. In my post “China Conducts Lunar Ship Return Test for Hypersonic Weapons” on October 23, I said: the lunar spaceship does not fall on the ground and then rest on its pit like a meteor. It hit the ground and then bounces back into the air and falls down again. That was based on CCTV report on October 22. However, Global Times said in its report on October 24: According to Zhang Wu, deputy chief designer of the lunar spacecraft launched this time, the spacecraft will go half a circle round the moon and then return to the earth. Due to the acceleration caused by the gravity of the earth, the speed of the spacecraft increases to 11 km per second, i.e. Mach 36. After it goes lower into the atmosphere to slow down, the flight control will make it rise up above the atmosphere and then reenter the atmosphere so that it may land on the earth at an acceptable speed. By so doing, China will obtain key technology and data related to the reentry with high speed, including the design and data related to orbit, pneumatics, heat resistance, navigation guidance and control. The open purpose of the flight is to make preparations for the next lunar test to send a spacecraft to land on the moon to collect samples of the soil on the moon and bring them back to the earth. However, the secret purpose is to achieve the hypersonic speed of Mach 36 and obtain the key technology and data related to the hypersonic glide vehicle (HGV) at the speed that so far an HGV cannot achieved if launched from the earth. The test is very useful for an aerospace bomber flying at a relatively high orbit around the earth diving down to hit targets on the earth. Due to gravity, its speed will be greater than the speed of March 23 when it flies on its orbit. The bomber shall be able to control its missiles at such high speed. The heat resistance materials shall be able to protect the bomber and its missile and enable them to remain intact when they hit their targets. Moreover, the bomber shall be able to rise back above the atmosphere to circle round the earth again. From the above description, we can see that the test flight of the lunar spacecraft is highly related to China’s development of hypersonic weapons. We have US media Foreign Policy’s report “Beijing, We Have a Problem: Is India surpassing China in Asia’s space race?” making comparison between Indian’s success in sending a spacecraft to Mars and China’s recent test of lunar spacecraft. It shows American media’s mentality. The US incurred lots of expenditures in its lunar program for the only purpose to be better than the Soviet Union in landing people on the moon without bringing any economic benefits from the moon. So is India now. It wants to show that it is better than China by sending a spacecraft to Mars without bringing back any benefit. China’s lunar program aims at obtaining practical benefits. First, it enable China to obtain technology for its weapon development. Second, the program will finally enable China to establish a colony on the moon to exploit the resources there. That indicates Chinese leaders’ wisdom in refraining from pursuing the vanity to be the number one in the world or to show China is better than any other country. Just be practical to be benefited from what they do. I hope that they will not be affected by India’s space race with China but persist in achieving their aims of weapon development and lunar colonization. They shall not have any Mars ambition now as so far there has been no technology at all to colonize Mars. Is India surpassing China in Asia’s space race? Call it a mark of maturity. Without much fanfare, China launched an unmanned, unnamed spacecraft on Oct. 24, possibly paving the way for a more sophisticated moon vehicle in 2017. But this milestone comes less than a month after India’s celebrated Mars mission reached its destination. In the court of public opinion at least, Beijing looks unlikely to top it. Delhi’s first interplanetary probe Mangalyaan (“Mars craft” in Hindi) became a worldwide media darling, a classic underdog story. The odds were not in its favor: two-thirds of all Mars missions had failed, including China’s most recent attempt in November 2011. After six loops around earth, an innovative and inexpensive slingshot effect flung the satellite into orbit nearly a year ago, vaulting India into the global elite space club. While India’s main space agency, the Indian Space Research Organization, insisted the launch had nothing to do with Beijing’s extra-orbital attempts, merely getting off the ground was a victory: one small step for India’s shoestring space program, one giant leap for its self-esteem. The scientific urgency of Mangalyaan is questionable: surveying the Red Planet’s atmosphere and surface (which the NASA spacecraft Mariner-4 photographed back in 1965) for just six months will likely add little to the world’s understanding of outer space. “It is as if the thirty-first scientist to voyage to the Galápagos Islands had stayed only a couple of days, sketched one or two of Darwin’s finches, and then left,” wrote Indian journalist Samanth Subramanian in the New Yorker. And yet Prime Minister Narendra Modi (fittingly, in a red vest), basked in the glory: India, he said on the day Mangalyaan reached Mars, is a future “world guru” who had “achieved the near impossible” and become “a shining symbol of what we are capable of as a nation.” When NASA’s Curiosity rover, which landed on Mars in August 2012, congratulated Mangalyaan on Twitter, it replied confidently: “Howdy @MarsCuriosity? Keep in touch. I’ll be around.” The cheapest Mars mission ever, at $75 million — three-quarters the cost of Hollywood space blockbuster Gravity, and less than the first U.S. stealth-jet attack on Syria — Mangalyaan has boosted Modi’s “made-in-India” vision. And it’s an ideal time, as the new prime minister has come to power amid grand promises of an Indian renaissance. India’s foray may be remedial and its scientific value sketchy, but it puts the country alongside the three superpowers — United States, the European Union, and Russia — that have reached Mars. The subcontinent’s press, convinced that India went to Mars to show China it was still a worthy rival, rejoiced in unabashed nationalism. They may have unwittingly launched a space race. But it’s relatively friendly for now. Beijing wasn’t “jealous,” nationalist newspaper Global Times sulked in late September: “no country can claim to be a leader in every arena.” (Hua Chunying, a Foreign Ministry spokesperson, was more diplomatic, calling Mangalyaan a “pride of Asia” and refusing to rule out future cooperation.) China does not disclose its spending on space — “a black hole,” experts joke — but it likely far exceeds Delhi’s. Space exploration, of course, is not the only geostrategic sphere in which India and China jostle. Their rivalry for influence, markets, and energy resources, plays out in Africa, Latin America, and the Indian Ocean, and their shared border along the Himalayas has been the site of recurring standoffs since the 1962 Sino-Indian war. Nowadays, China wins in most departments: its economy is bigger, its growth faster, its poverty levels lower, literacy rate higher, and military more powerful than India’s. For India, haunted by inferiority complexes vis-a-vis its giant neighbor, space offers a chance at redemption: next up, a manned mission and a pan-South Asian satellite. The space club, like the nuclear club, equals great power status: a PR-coup to wash off the “developing country” brand, with spin-off benefits for both the national economy and defense. If this is the Asian Century, its space age may well be Asian, too. Cash-strapped and overstretched, America’s pre-eminence in space is no longer a given. No human has been to the moon since 1972: the next time this happens, it seems increasingly likely to be an Indian or Chinese astronaut. Asia’s obsession with space is a logical extension of rapid economic growth, increasing power, and an appreciation for science, says Bharath Gopalaswamy, space analyst at the Atlantic Council’s South Asia Center. “It’s communicating ‘you can do this too,'” to its own population, he adds. It encourages “people to embark on scientific projects that might seem impossible.” And, says Heritage Foundation senior research fellow Dean Cheng, space has great spinoff benefits for militaries, especially with regards to information systems and surveillance. It isn’t just India trying to keep up. Other new kids on the block with recent launches of satellites and rockets include Japan, Vietnam, Thailand and Taiwan, among others. Russia talks about another lunar mission. South and North Korea both dispatched satellites in 2013, the former setting a 2020 deadline for a lunar rover. And Iran propelled a monkey into orbit in preparation for a human spacecraft by 2020. Outer space is currently collaborative: the International Space Station, the largest artificial satellite in orbit, has been manned since 2000 by a joint 14-nation effort, though most of the funding comes from the United States. But when the money dries up in 2020 — the same year India and China have hinted they would like to launch manned spacecrafts — this short era of international space cooperation may come to an end. Notoriously fond of mega-projects, Beijing’s gravitation towards the final frontier seems logical: inheriting space hegemony as ultimate proof of its arrival as a superpower. And superpowers can get carried away by national pride. In a 2012 book, Indian space analyst Ajey Lele called Asia’s space competition “the most exceptional and widespread security dilemma in the world,” with risky constellations including India-Pakistan, China-India, and Sino-Japan, and the Koreas. The United Nations condemned North Korea’s space launch as a disguised ballistic missile test (attempts to condemn Iran’s on similar grounds were blocked by China and Russia); similarly, China’s decision to shoot down one of its own dead satellite in 2010 caused alarm in Washington and in neighboring capitals, over fears that space junk could litter near-earth orbit and concerns that the technology could be could lead to a regional arms race. While space has always signaled not-so-subtle nuclear readiness (after all, what are rockets if not long-range missiles?) the real concern today, Cheng argues, is technology that can disrupt other countries’ space assets. Such technologies, so far only demonstrated by China, seem straight out a 1970’s James Bond film: satellites with robotic arms that could take out other probes, techniques to bump other satellites off course, shoot them down, or blind them with lasers. But other countries are not far behind. China’s decision to invest in offensive space technology, says Moltz, means India is now increasingly focusing on the military space realm as well. But watching this extraterrestrial competition from Europe or the United States, however, it’s hard to be dispassionate about its potential implications. Source: Foreign Policy “Beijing, We Have a Problem: Is India surpassing China in Asia’s space race? Maintaining CCP (Chinese Communist Party) Dynasty’s rule is the Dynasty’s top priority. That is why Chinese legal system must be controlled by the Dynasty. Unaware of that basic nature of the Chinese political system, Western China watchers and media want to see that China’s reform will lead to Judicial independence from the Dynasty. As long as the Dynasty remains, China’s judiciary will never be independent form the CCP. There will be CCP’s dominance in everything. In my post on October 24, I pointed out the existence of the rule of CCP’s party discipline above China’s legal system. China’s legal system cannot touch a CCP member until the member is expelled from the CCP. Rule of law or constitution? Only when rule of law and constitution is subordinate to CCP Dynasty’s rule can there be such rule. Remember, laws and constitution are formulated by the CCP. CCP may formulate laws to restrict its members, but it will never formulate laws or constitution to deprive it of its dominance. (Reuters) – China’s Communist Party pledged on Tuesday to speed up legislation to fight corruption and make it tougher for officials to exert control over the judiciary, even as it stressed full control over the courts. The decision, released by the official Xinhua news agency, was reached at a four-day party meeting, or plenum, last week. The party said it would “prevent extorting confessions by torture” and prevent miscarriages of justice with a “timely correction mechanism” following a series of corruption investigations involving torture that have outraged the public. The plan to prevent forced confessions, which had been flagged last year, is aimed at preventing abuses under the party’s anti-corruption watchdog, the Central Commission for Discipline Inspection. Some legal cases have illustrated the brutality of a secretive detention system for party members, known as “shuanggui”, and the drive to get confessions as President Xi Jinping presses on with an aggressive anti-corruption campaign. Lawyers had raised questions about the legality of the process, calling it unconstitutional. The party said it would “uphold” the Political and Legal Committee, a secretive body overseeing the security services that many lawyers have blamed for interference in legal cases. “They are not ready to move forward with abolishing the institution and I think that will be a problem in future,” said Bo Zhiyue, an expert on Chinese politics at the National University of Singapore’s East Asian Institute. Legal scholars had hoped the party would reform the Committee, which they say would be a repudiation of former domestic security chief, Zhou Yongkang, who is under investigation for corruption and has been blamed for much of the abuse of the rule of law. The party promised the separation of local powers from the courts through the establishment of courts spanning administrative regions but it stressed the judiciary would remain in its grip. Xi said in a speech to the party that its leadership was “the most fundamental guarantee of socialist rule of law”. The moves, made after last week’s closed-door meeting of the party’s elite, are pivotal to the workings of China’s market economy, the world’s second largest. They come as slowing growth raises the prospect of more commercial disputes. The measures also reflect leaders’ worries about rising social unrest. Anger over land grabs, corruption and pollution – issues often left unresolved by the courts – have resulted in violence between police and residents in recent years, threatening social stability. The party would accelerate national anti-graft legislation and improve the system of punishing and preventing corruption. The party also said it would promote pilot programs aimed at judicial independence and the separation of powers. The party also said officials had to pledge allegiance to the constitution before taking office. Legal scholars are skeptical about significant change under one-party rule. For sensitive cases, such as high-level corruption or for prominent dissidents, the party will remain in charge. Still, the announcements were emblematic of Xi’s agenda. Since he took office in March 2013, Xi, who has a doctorate in law, has vowed to put “power within the cage of regulations” and waged a war against corruption, winning over many ordinary people. This year was the first time the party made “governing the country by law” the focus of the plenum. He has abolished a system of labor camps and called for judicial independence under the party. But at the same time, his administration has detained dozens of dissidents in what some activists say is the worst suppression of human rights in years. Despite the legal reforms, Xi has shown no interest in political change. It is uncertain how much of an impact the plenum’s policies will have. Laws are often not enforced and can be abused by the police. Full details of the reforms will likely be unveiled in coming months.